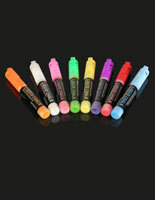 What special features do these chalkboard markers offer that make them appealing to retailers? These wet-wipe tools are the perfect writing utensil for window signs. 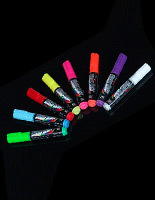 These chalkboard markers that are liquid chalk are bright and colorful, and are sold in a pack of either 3, 4, 5, 6, or 8. These messaging supplies are meant to be used on glass to create eye-catching advertising. 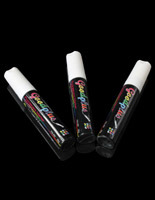 Available in myriad sizes for messages of varying thickness, these chalkboard markers, also known as liquid chalk, can be wiped off with lint-free cloth or sponge. 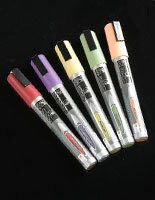 Old messages by these ink pens can be easily erased or updated; a selection of dry-erase pens is available at this site, too, which can be updated and washed off with a dry rag. 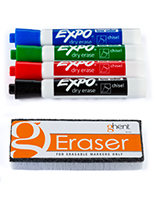 But the bulk of chalkboard markers that are liquid chalk accessories are water-soluble, which means they work on non-porous surfaces like glass or acrylic. No smearing, no hassle wet-wipe messaging using these quality writing instruments is desired by every business owner advertising goods and services! 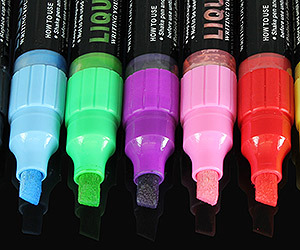 What are the features of these liquid chalk accessories for retail? 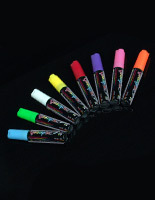 Multi-colored chalkboard markers are sold in quantities of 3, 4, 5, 6 or 8 pens for users to create brightly colored, easy to read signs. Pick a size, any size: 1/4”, 5/16”, 1/8”, 3/8”, 5/8”, 1/16”, 3/16”, 5/16”, or 9/16” for big signs, small signs, seasonal messages, or vibrant art work. Choose from the following tip designs: chisel (slanted), bullet, flat for both text and pictures with thin to thick drawing options. 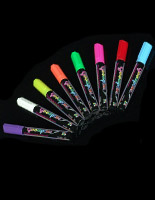 Select from a plethora of gorgeous fluorescent colors including neon pink, bright blue, neon yellow, black, or white, that simply “glow”. Markers for outdoor signage are ideal for writing on windows about menu specials, store sales, new merchandise, or business hours. The use of a lint-free cloth is recommended when erasing written messages or art work that have been drawn using liquid ink. These markers glide over non-porous surfaces such as glass in a storefront or car window (tailgaters love these accessories to write celebratory messages about their team! 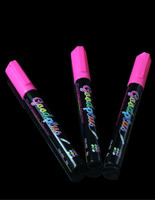 ); write-on/wipe-off signs, or acrylic surfaces. Choose a narrow tip style for precise messages, or a thick one for filling in pictures. 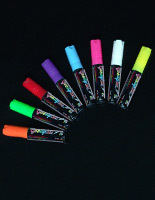 These quick-dry markers are sold in a variety of bright colors and in varying numbers per pack. 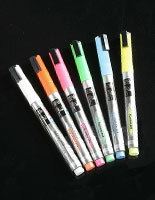 Retailers prefer these no-fade, colorful pens with no chalk dust. Choose a bullet tip for writing clear text on a sign, or a thick, flat tip for pictures. For versatility (and so you don’t have to purchase more than one set of utensils), select a chisel style tip, which offers both thin line drawing, or thick coloring. Fluorescent pens in bright colorful ink work beautifully on glass to make impactful messages that glow under fluorescent or ultraviolet light. The great thing about utensils like these is they are easy to wet-wipe with a damp cloth, due to water-based ingredients. 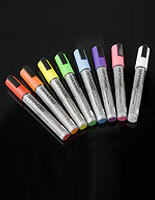 These bright colorful ink pens pack a punch, drawing attention to any message that’s written. 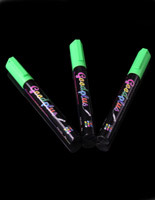 Announcements using these quality markers are vivid, not to mention they won’t fade. Buy accessories for writing on a window from this website. 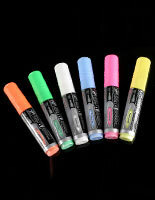 These colorful markers should be used on non-porous surfaces. Restaurants, cafes, bars, boutiques, and salons are among those venues where these utensils can be of great use. 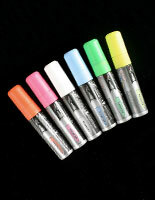 Find sign supplies to go with these bright markers for wet-wipe pens like easy-to-update sandwich signs right here.